Where can you learn about Smart Growth and Greenbuilding? Ecobuild America is an international expo focused on sustainable development. And GreenOrlando has free passes to get you inside. What is smart growth? Smart growth is a concept, a movement, an idea, that we can better plan and manage how we grow. From my house, I can walk or ride a bike straight to my son’s school, safely without ever having to cross a major road. That’s smart growth. Greenbuilding is about building homes, offices, schools and retail centers that use less energy and water. They’re designed to use more natural light, better handle air and are super-insulated to save on energy. They impact the site less and live within the space more naturally and use landscaping and placement to shade and manage water consumption better. There’s been a technology revolution in this space and Ecobuild America exists to show builders, architects, home and business owners alike all about the products and services that are changing the way we build and live in buildings. How can we live more efficiently… and why would we want to? As more and more people move into the state of Florida, natural resources, such as water, and energy use starts to put a strain on our environment. Traffic congestion, polution and consumption rises and ultimately impacts quality of life. That’s all fine, but how does that effect me, the consumer, you might ask. Each of us can make small changes in our purchasing habits–and these changes can save us money. Whether at home or in a 20,000 square foot office, these purchases impact your wallet. If you use less power, you save on your power bill. And this expo shows many products that can save you money. If everyone in Central Florida, for instance, replaced the light bulb on their front porch with a compact flourescent, then you’d see dramatic shift. Not only would you make up the higher cost of the better, new fangled bulb, you’d save on energy consumption. Even better, your dollar vote would make the industry take notice, and offer more products that save more energy and lower the cost of that product; Supply and demand. And there’s much more you can do than buy a light bulb! Not only is the industry concerned about saving energy, the green building world is also concerned about your health. From carpeting that resists molds and helps you breath easier with less toxic materials to using recycled materials, more and more manufacturers are making products that impact your living and working space. Greenbuilding started out as urban renewal in the 70’s and today is already touching most Americans. Your washer, dryer or refridgerator probably came labeled with Energy Smart information to help you decide which one to buy. Some produsts are labeled as energy efficient and bear the Energy Star label. Things are getting better and we are using more and more technology and best practices to change our world for the better. But it still takes effort and the quicker we change, the better our communities will be. 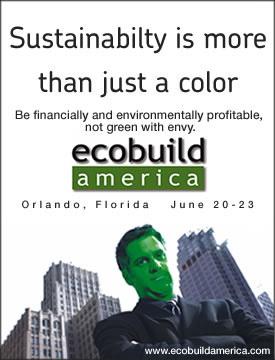 If anyone would like more info to EcoBuild America, just send us an email or visit their site. We still have passes, if you’d like to get into the expo on us. We also have conference planners in our office if you’d like one.